Really lovely top. As soon as I put it on and looked in the mirror, I felt a different person! Such an elegant and pretty design - the neckline is really flattering, and so is the blouson style - it covers up slightly large waists! "Lovely top good fit "
Ladies comfortable pull on style Blouson Top with three quarter sleeves designed to cover the elbow. Flattering ruched shoulders and a broad welt. An eye-catching floral print in shades of pale blue, cornflower and sapphire on a white base. 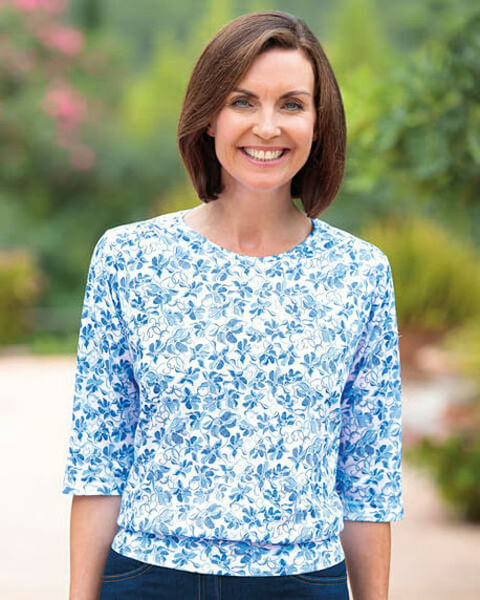 Comfortable yet stylish, this pretty patterned top would be a welcome addition to any wardrobe.